They are the meaning of life. Honestly. And finding a good gluten-free cookie is like finding a little slice of heaven. Awhile back, I raved and raved about how delicious (and affordable!) the original gluten-free Joe-Joe’s were. So, while we ducked into Trader Joe’s one morning before the holidays, Cathy spotted a box of regular Candy Cane Joe-Joe’s. After a “What is this shittery?” moment, the cookies were in the basket for her to have as one of her snacks during the work week. We then proceeded to pick up our usual Trader Joe’s purchases…gluten-free oats, two different kinds of peanut butter, and maybe something else…depends on the week. “Go see if you can find the Dark Chocolate Covered Mint Espresso Beans.” Those are magical words, friends, because those little beans are my favorite thing in life. Sadly, Trader Joe’s did not have them this year. I cried. No really…I cried. But, my search for minty dark chocolate caffeinated pellets of awesomeness did not go unrewarded. I spotted the box and had to stop…take a few steps back…blink…rub my eyes…and then pinch myself. YES! There, on this little shelf over some frozen food stuffs was a box of…Gluten-Free Candy Cane Joe-Joe’s. Like…like the ones Cathy was able to eat…except made for someone like me! Do you realize how weird it is to find flavored sandwich cookies? Trust me…it doesn’t happen often. I decided if I couldn’t have my minty and dark chocolate coated espresso beans…these would be a good substitute. I snagged the box and went skipping off to find the roomie. And…we now each had a box of Trader Joe’s signature sandwich cookies…in holiday peppermint form. Yum yum. But…as she preferred the gluten-free regular version of the Joe-Joe’s to the regular Joe-Joe’s…perhaps that would be the case here too. So, the other night…with dessert being needed…I grabbed this box out of the pantry and dished out two cookies to each of us…with a little cup of milk. Because…that’s how sandwich (or cream-filled) cookies should be eaten. And they should be dipped to the point of complete mush and then savored. YUM. I handed hers over first and she took a bite, immediately saying how she hated fake peppermint flavor again. I sighed. But then she said that, once again, she preferred these to the regular version she had prior to this. Now it was my turn to see what I thought. I settled in and took a bite without dipping it just to get the initial flavor. The chocolate gluten-free cookie was delicious and rich. And the filling…it was minty, but not overly so, but definitely minty. Even better, these are definitely stuffed with the cream filling. They definitely don’t skimp on that. I appreciate that…because if I am buying sandwich cookies, I want them to be filled. There were flecks of candy cane throughout the filling, giving it that flavor, which doesn’t overpower at all. And dipping these into a glass of almond milk…OMG…YUM! I am definitely loving the holidays this year…as they brought me a few new items to try…including these. Trader Joe’s does amazing things with their gluten-free line. And I continue to enjoy two cookies and a glass of milk after dinner each night. Let’s look at the ingredients that go into Trader Joe’s Gluten-Free Candy Cane Joe-Joe’s, shall we? These cookies are made from cane sugar, a grain blend (corn flour, rice flour, potato starch, corn starch, soy flour, potato flour, tapioca starch, xanthan and arabic gum, and carageenan), palm oil, cocoa powder, crushed candy canes, canola oil, invert syrup, egg white powder, natural flavors, baking soda sea salt, soy lecithin, and ammonium bicarbonate. These cookies are gluten-free, dairy-free, and cholesterol free. As for nutrition, as far as cookies go, these aren’t bad. 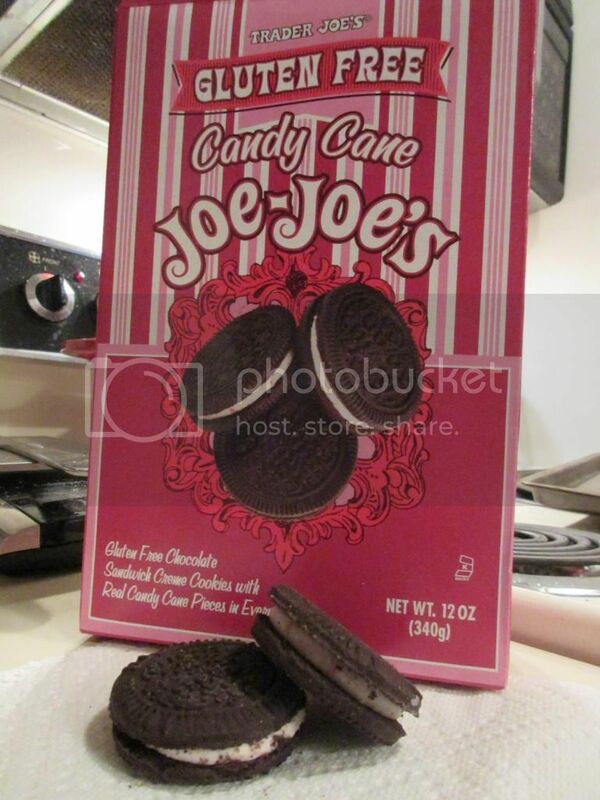 A serving of the Trader Joe’s Gluten-Free Candy Cane Joe-Joe’s is 2 cookies. These two cookies will deliver 150 calories and 7 grams of fat. These cookies will give you 75 mg sodium and 13 grams of sugar. And, finally, these cookies will provide 1 gram of fiber and 1 gram of protein. I really appreciate it when a company takes the time to duplicate a regular product and make it gluten-free. I have yet to find a product in the Trader Joe’s gluten-free line up that I don’t like. These cookies are a delicious and minty treat, which normally I wouldn’t have the opportunity to enjoy. I wish these were around year round. But, you can bet that I’ll be looking for them next year. This entry was posted in Chocolate, Cookies, Dessert, Food, Gluten-Free, Products, Review, Snacks, Sweet Stuff, Vegetarian by The Celiathlete. Bookmark the permalink.